Sydney Central YHA was voted the best in Australia and the second-best in Oceania in 2009, and this clean, spacious hostel continues to receive high ratings, especially for its location. It's set next to the buses and trains at Central Station and is a short walk from Paddy's Market and Chinatown. 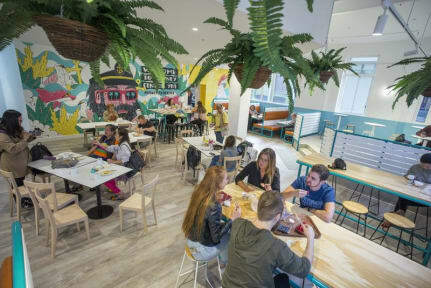 Hostelworld reviewers tell us that 'this is a fantastic place buzzing with international travellers, things to do and ways to meet other people'. We particularly like their two big kitchens, ensuring that there's still enough space for everyone to cook in this large hostel. Clean room & bed. Charging outlets in locker. Only negative was the room was quite hot. I stayed 5 nights, this is a great hostel. Only down side was the slow as lifts, other then that is it pretty good for a hostel. The kitchen facilities are great and staff always keep it clean. Bathrooms were generally clean, they obviously are clean regularly, it would really depend on how messy people were on a particular day as to how dirty the bathrooms got. There are lots of communal areas and a nice rooftop with pool and sauna. Location is great. Overall its a great place to stay. The hostel is very conveniently located to Central Station. A lot of the major attractions are about a 30 minute walk away or a 15 minute metro ride. The staff were helpful. It is a very large hostel, but I never had any issues waiting for showers or toilets. My room happened to be on the side right next to a club, so there was quite a lot of outside noise on Friday and Saturday nights (although the hostel itself was quite quiet). A good pair of earplugs took care of most of it. Beds were fine. Great hostel, lots of nightly events on to meet people! Showers were spacious and clean. Big kitchen facilities. Perfect location! Lovely people, staff sometimes reluctant, great extra activities! If you’re needing a place for the evening, I would recommend YHA. The location is prime as it is across from Central Station and within walking distance to many restaurants and shops. If considering for a longer stay, you will have to consider that wifi is not accessible in your room and only available on certain floors. A nice hostel in a great location. Friendly staff! Was surprised at the amount of older guests staying, many 40/50+ in age. This is fine but it didn’t create the social atmosphere I was looking for. Not a social hostel, wouldn’t recommend for any travelers looking to meet others! No great events coordinated. Also no WiFi in rooms. There is air con and nice rooms and big lockers though, so you can get a good nights rest if that’s what you need. Strangest hostel I’ve stayed at. More of a hotel and had no limitations on guests. There was a school trip so lots of children and old people. In 6 days I met about 3 people. It just had a really strange vibe. The pool is pretty much utterly unused so isn’t a place to meet people. Nothing really bad to say about the facilities, but easily one of my worst hostel stays in 3 years of travelling.